As a highly-valued reader of CMM, you should have every expectation that the copy you read is accurate, fresh and unbiased. Apologies, as while I can comply with the first two I’m going to struggle with the last. I sampled a Honda CB92 more than a decade ago, coming away utterly captivated. And today I’ve another chance to ride the legendary CB92 Benly Super Sport. I’m like a dog with two tails; these little guys really float my boat and I’m not the only one thus besotted. You see, in the very late 1970s (when old Japanese bikes were generally perceived as just so much junk) a small but dedicated group of oddballs began restoring oriental motorcycles. From this small cadre of fans for all motorcycles Japanese was born the American arm of the VJMC (Vintage Japanese Motorcycle Club). Even that far back one of the must-have machines was the Honda CB92, aka the Benly Super Sport. 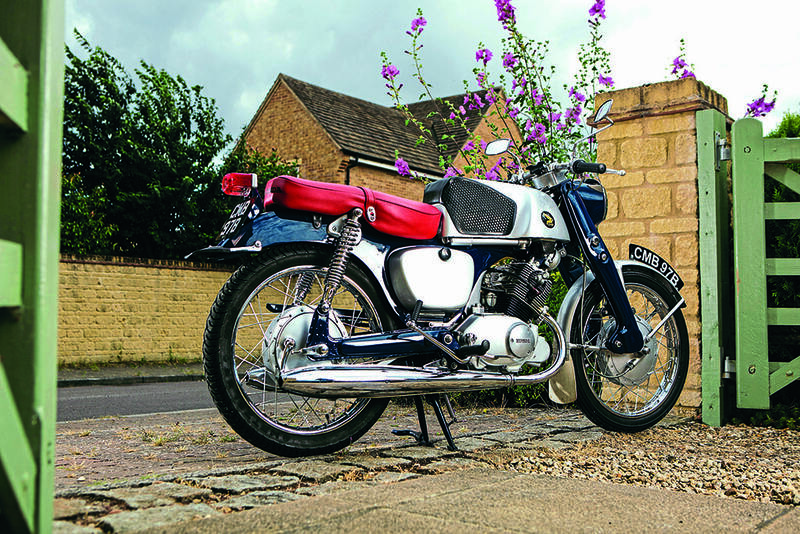 Despite the bike’s odd styling and apparently frankly perverse colours offered on some machines, the little 125cc OHC twin had garnered a small legion of fans. In the Benly’s heyday if you wanted a four-stroke then Honda was your only option and, fortuitously, the company then had the largest number of dealers Stateside which meant better customer support. Also many didn’t trust two-strokes at that point in time and this played right into Honda’s hands. 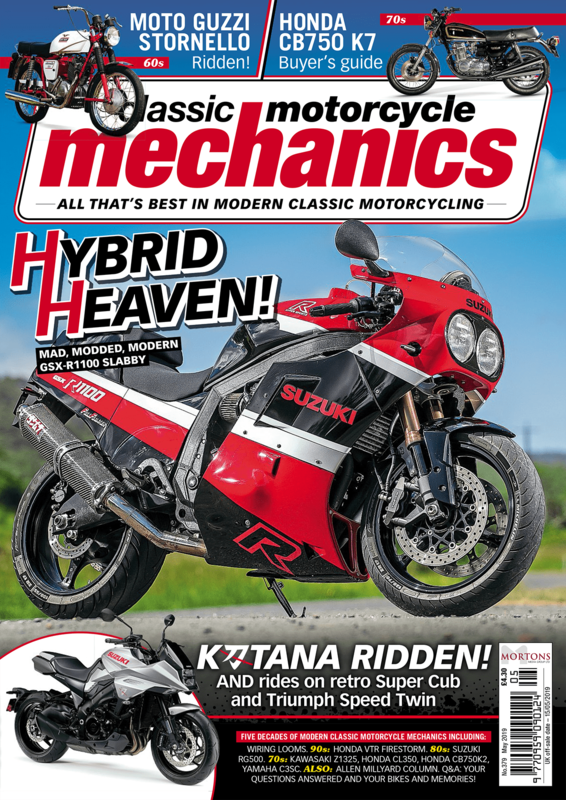 Factor in overtly positive press reports on the small Honda twins and it wasn’t long before the Benly became the bike that people with aspired to. So it’s rather fortunate that we have access to CMM supporter Karl Chadwick’s exquisite example. When we rock up at his garage and I start slavering over the CB92 he pops the following question: “Do you want it with the black seat on or shall I get the red one down and fitted?” Benly devotees know that the red bikes normally came with a black perch while the dark blue ones arrived with an outrageously bright red one. This, incidentally, was an artefact of the very earliest Hondas copying the market trends of West German motorcycles where Soichiro Honda took a lot of inspiration from. And that very fact is borne out by our bike in camera which sports Germanic features as per the late 1950s NSUs; pressed steel frame and leading link forks of the same construction. However, where Honda struck out on their own was the apparent random use of oddly angular trim. The fuel tank has a mass of dramatically sharp pressings that are then only mildly diluted by the semi-all-encompassing tank rubber that doubles up as knee pads and gonad protector. Both the headlamp and speedo are overtly square with rounded sides and then there are those trapezoidal side panels and the frankly bizarre triangular mounts on the top of the exposed spring shock absorbers. 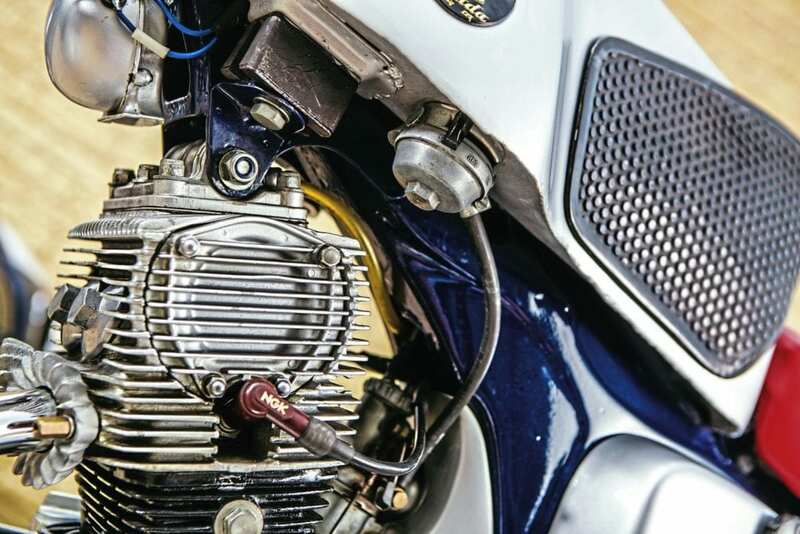 The engine is fairly angular as well but then Honda adds in a curved alloy carburettor cover so that the line of the lower part of the pressed steel frame flows into the top of the engine and the cylinder block. If you handed that little lot to a stylist on a sheet of paper he’d laugh at you saying it won’t work. Well, truth be told, it shouldn’t and yet somehow it does. Outside of the strange styling, which en masse is unique to Benly, there are a few details that covertly give away something of the bike’s purpose but only if you know what you’re looking for and at. First and most obvious is the little fly screen which was offered as an optional extra; its format is contemporary with similar screens used by Yamaha. Next to give the game away is the front mudguard which hugs the tyre a lot closer than pretty much anything else of the period. And finally take a look at the front brake; does it really need to be a twin leading shoe item and of such proportions on a 125? And then the penny drops: the little Benly is a racer on the road. 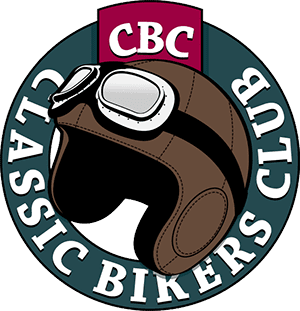 If the CBX1000 was Honda shouting out ‘this is who we are and what we can do’ then the CB92 was almost a gauntlet being thrown down to all and sundry stating ‘we are ready to defy convention and expectation’. The Benly appeared the same year that Honda first contested the TT races (1959) and just four scant years since Mr Honda himself vowed his fledgling company would compete in the island. The bike carried huge expectations upon its diminutive shoulders; aimed at being user friendly and hugely reliable while at the same time capable of frankly outrageous performance for the era. The fuel goes in via a cute if almost impossible-to-source sliding fuel-tap to the left side of that iconic tank. On the right-hand side is a period fitment common to many of the early Japanese machine in the guise of a tyre pump. 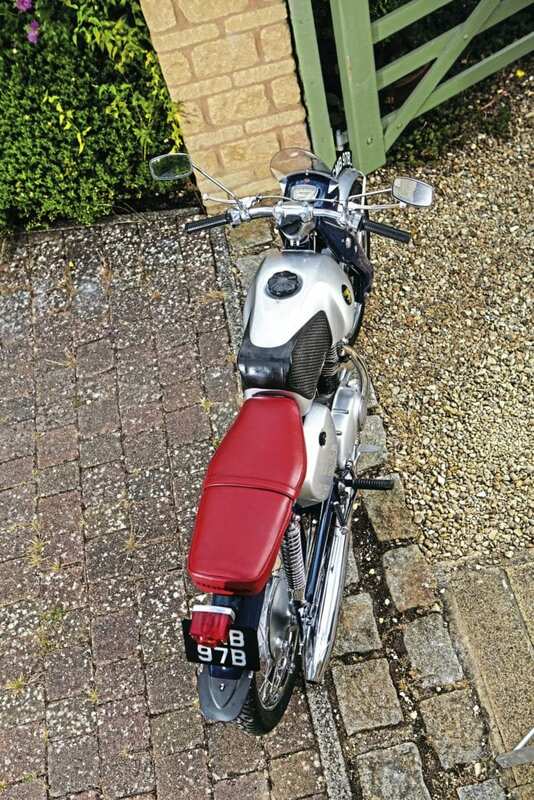 Starting this jewel of a motorcycle can be done either via unseemly kicking or, with huge kudos for the day, a gentle press of the electric start button on the right bar. 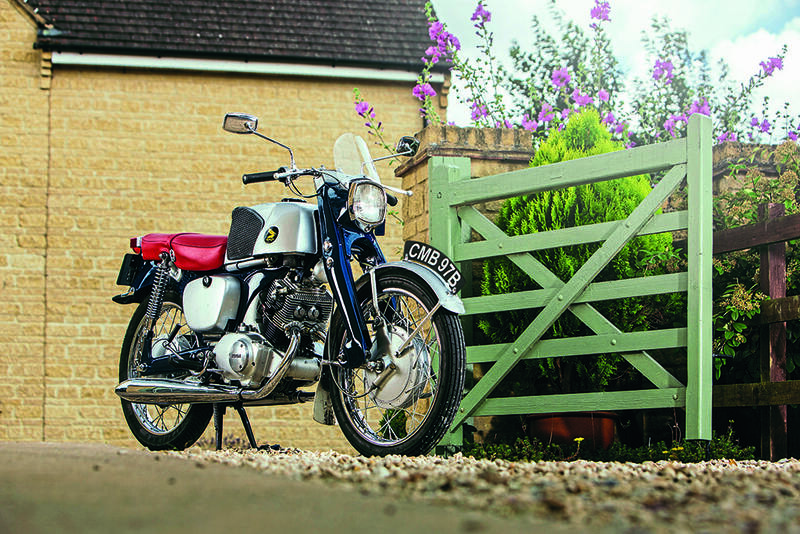 The six volts spin the twin pistons instantaneously which catch the vapourised offerings from the tiny single carburettor and hurl the motor into immediate life with a bellow that defies belief…and we’re only running at tickover! 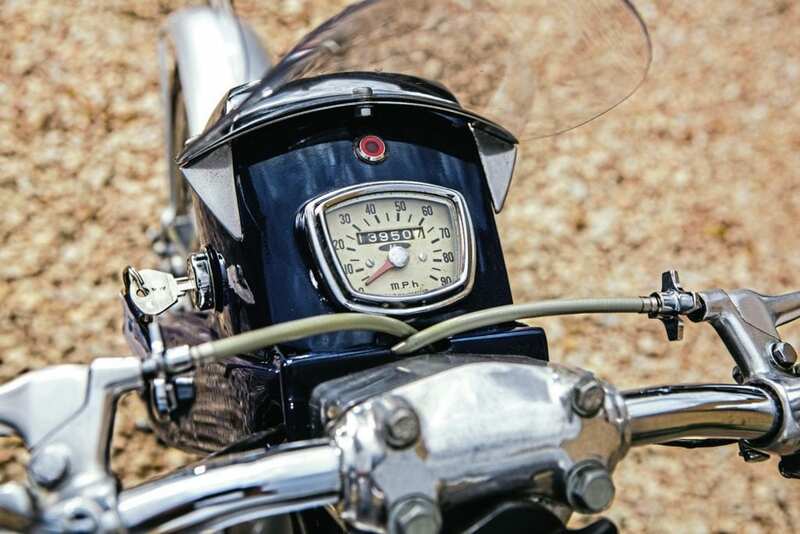 Blip the throttle and the tiny twin shouts its presence, laying down a challenge for anything else on two wheels. In reality it’s like opening the back doors of a van whose barking resident has caused mothers to protect their infants only to find the canine within is a lovable if boisterous spaniel. 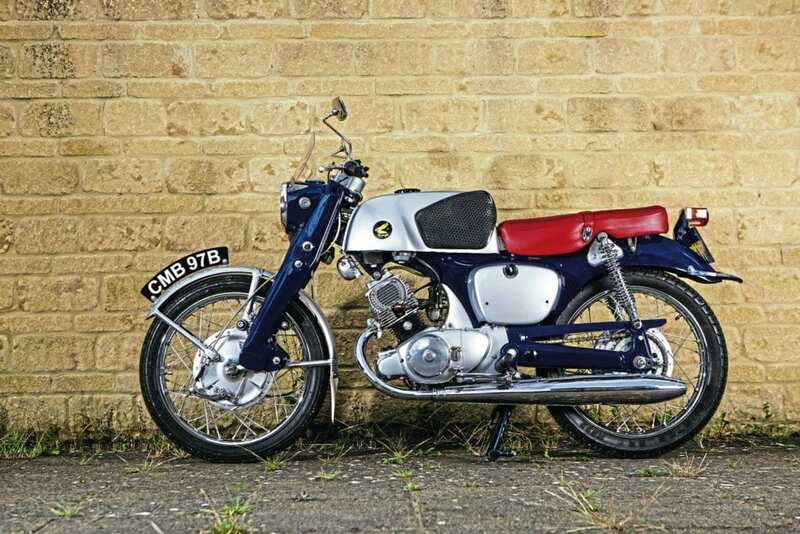 The CB92 is and was as much about image as performance. But enough analysis; let’s see if it’s still as good as I remember. With only one eighth of a litre under its head the bike has to be ridden relatively hard to get the most out of it. Those that didn’t know better might suggest such actions are tantamount to abuse. Those that do appreciate that this is exactly how the bike wants to be treated. Yes, sure it will tootle along on a whiff of throttle but that’s not its purpose in life. Grab a fistful of revs and beast the little fella. With no tacho fitted you gauge the motor’s speed by ear, which isn’t hard given racket coming out of those cigar shaped seamed exhausts; notice I don’t call them silencers. At the appropriate point snick up a gear and then repeat at will. The only fly in the ointment is the gap between third and fourth (top) gear. Fortunately, however, you will have grasped that the motor isn’t afraid of revs so a few more need to be dialled in for that final upward change. And from there on it’s all about maintaining that speed regardless of road gradients or bends; the former ultimately take their toll but not the latter. Providing the Tarmac surface can be trusted the Benly can be hurled around with a level of gusto and enthusiasm that completely belies its age. It’s frankly astounding that something like this, mass produced, can track so well and so predictably. Yes the rear shocks are a little lacking but they’re no worse than anything that came out of Japan a decade or more later. All that inhibits this ageing loon on an equally old motorcycle is the single thought of touching down those almost irreplaceable exhausts and the stare I’ll get from its owner. I’ve sampled much newer machines that don’t come anywhere near equalling the little Benly’s poise and élan. Apart from the German NSUs that impressed Soichiro Honda it’s said the great man was also passionate about the exquisite racers from Italy such as the single cylinder MV Agustas and Mondials. Given their reputation you can’t help but wonder if they influenced the Benly’s geometry. The CB92’s leading link front forks seem totally unfazed by speed humps. Repeated transitions back and forth fail to wrong foot the bike which remains as stable as the one I rode all those years ago. Let me tell you about that front brake. You’d reasonably expect that a front anchor that large on a bike so small would be overkill but not a bit of it. Once again the R&D team back the Honda Hamamatsu plant had done their sums and got the various leverages, pivots and fulcrums bang on. The brake is progressively powerful and, amazingly for such a large unit, not grabby in the least. The rear brake does its job without drama but is ultimately eclipsed by it bigger cousin up front. 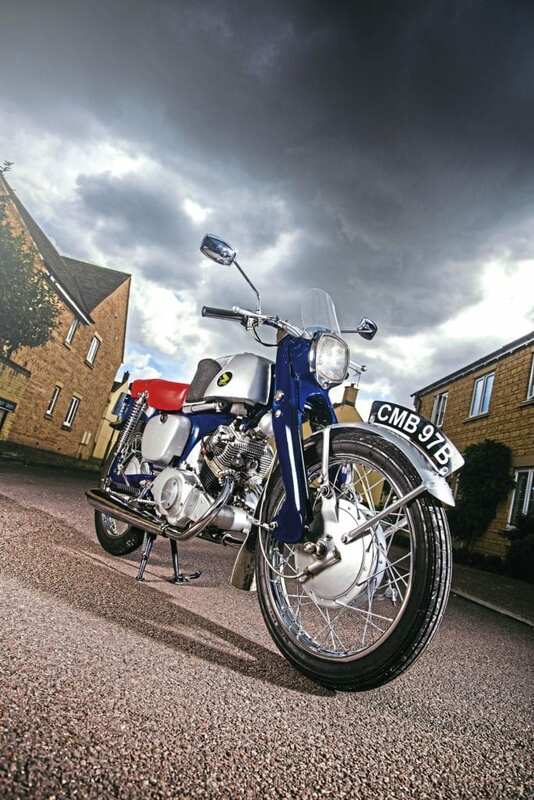 It is close on six decades ago since the first CB92s hit the streets and time has moved inexorably on leaving them, to some minds at least, as an anachronism, and old man’s machine, perhaps even a pseudo-fossil in waiting. While there’s absolutely no argument whatsoever that the bike looks old/odd/weird/quaint what hits me every single time I encounter these remarkable machines is two immutable facts. Firstly that something conceived in the latter half of the mid 1950s is still so accessible today and secondly, emissions issues aside, a contemporary version of the Benly styled to meet modern expectations would probably sell like hot cakes. So if they are still capable of inspiring and enthusing riders today just what must they have felt like all those years ago? Those guys that founded the classic Japanese movement inarguably knew a thing or two about old bikes! Previous Post:Endurance Legends is on!